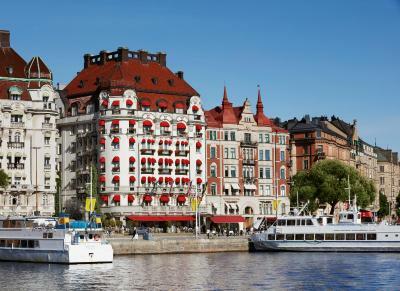 Lock in a great price for Hotel Diplomat Stockholm – rated 8.9 by recent guests! Everything about the Diplomat Hotel was great. From the welcome at the check in to the facilities, the beds, the bathrooms and the breakfast. It has been run by the same family for a long time, and you can tell there is extra care taken in every detail. Wonderful! The restaurant was very good as was the breakfast. Of special note are the staff who were very friendly and treated us as special guests. Of particular note is Maxwell who was so positive and helpful. Location is perfect. The rooms are very clean. The restaurant is wonderful. We had breakfast and dinner and loved all our meals! Eggs were great with the mustard. The best bread I have eaten. Perfect croissants. Staff goes out of way to help. Nice room, nice bed, nice pillows, great location. Staff very friendly and helpful. I had a bad experience last year but I think things has changed to the better. Staff was excellent. Max, the doorman, was super friendly greeted us every morning with a smile, and helpful. Front desk staff was very accommodating in finding a nice restaurant, massage (no spa at this hotel) and turned on sauna for us to enjoy. Room was very nice, clean, and room service (night bed turn down, bottled water) excellent, slippers, robe, etc. all very nice. Location superb! The view we had was beautiful- we requested and had a view room. Our daughter had a courtyard view, and it also had a peek a boo bay view and a terrace to sit on which we did not have and it was relaxing for her. The beds were so comfortable, and the bath products were lovely. The staff at the front desk, all service employees and the next door food service were outstanding and made our first visit to Sweden perfect. We will be back and recommend this to everyone! 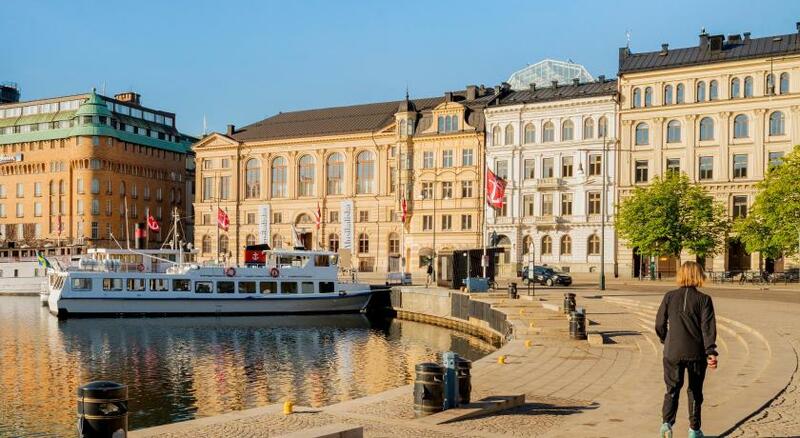 Hotel Diplomat Stockholm This rating is a reflection of how the property compares to the industry standard when it comes to price, facilities and services available. It's based on a self-evaluation by the property. Use this rating to help choose your stay! 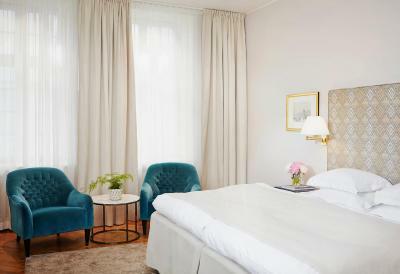 Set in an impressive 1911-era Art Nouveau building on upscale Strandvägen boulevard, Hotel Diplomat offers great views over Nybroviken Bay, free spa and fitness room access and a restaurant with summer terrace. WiFi is free. 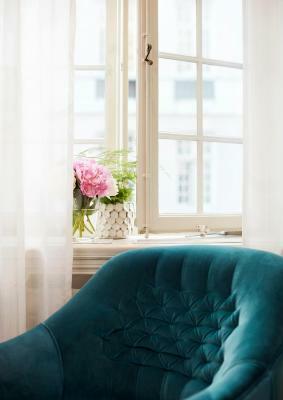 Diplomat’s modern interior was designed by renowned architect Per Öberg and combines classic elegance with contemporary design. 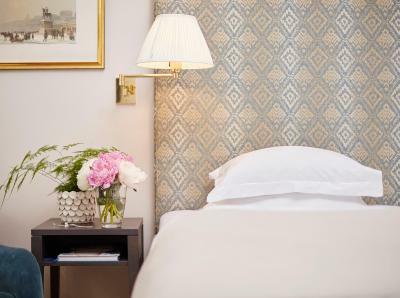 Each room features blackout curtains, a generous workspace and quality Dux beds with premium linen. All include luxury toiletries and a flat-screen TV with free video-on-demand. 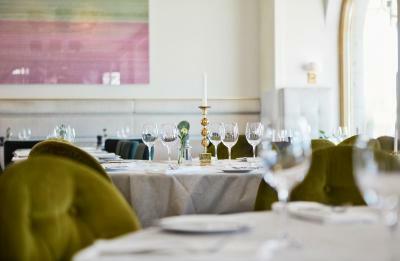 The in-house restaurant uses fresh, local produce to create classic Swedish dishes with a Mediterranean twist. The waterfront terrace is an ideal spot to take in the waterfront views during summer. 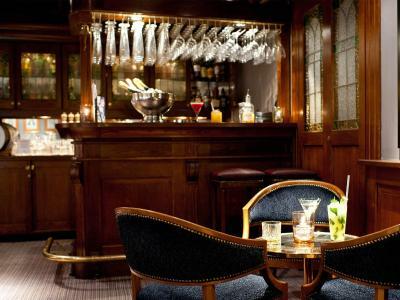 Guests can enjoy a glass of champagne or cocktail in the bar after a day exploring Stockholm. For relaxation or fitness needs, the hotel has a spacious, well-equipped gym and a sauna. 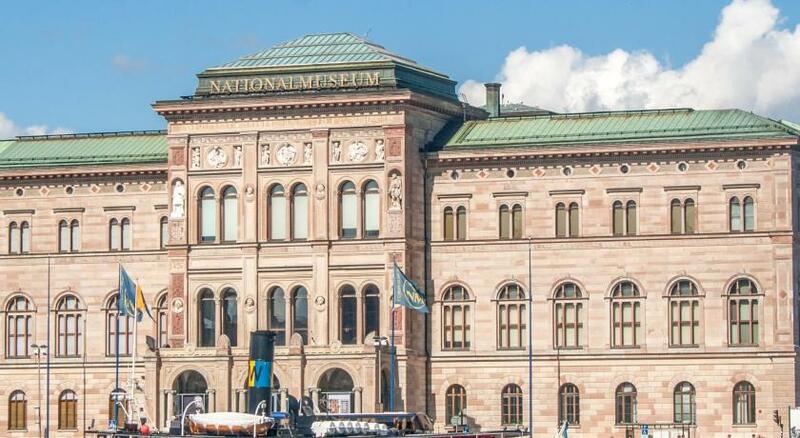 The Diplomat is just 1,000 feet from Stockholm’s Royal Theater. Local busses stops directly outside the hotel. Archipelago-bound boats depart regularly from across the street. 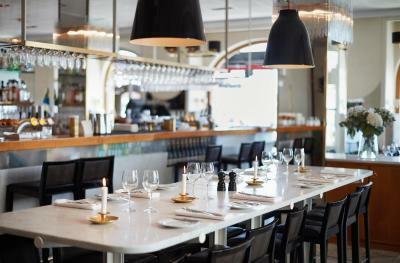 Östermalm is a great choice for travelers interested in food, shopping and museums. 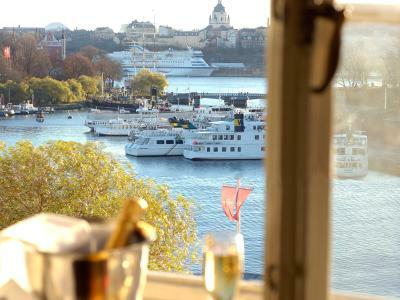 When would you like to stay at Hotel Diplomat Stockholm? 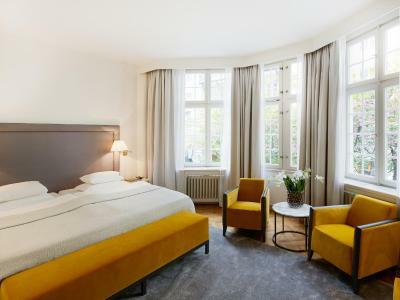 Overlooking the courtyard, this stylish room includes a quality DUX bed, minibar and flat-screen TV with free on-demand movies. Private parking is available at a location nearby (reservation is not needed) and costs SEK 595 per day. 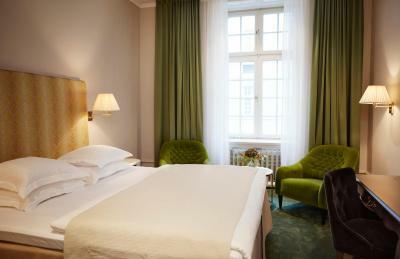 The Per Öberg-designed room has a large DUX bed, courtyard views and a flat-screen TV with free on-demand movies. Some have teak wood-paneled bathrooms with marble floors. These Per Öberg-designed rooms offer archipelago and street views, a large DUX bed and flat-screen TV with free on-demand movies. This smaller double room has a courtyard view that features a DUX bed, minibar and flat-screen TV with free on-demand movies. 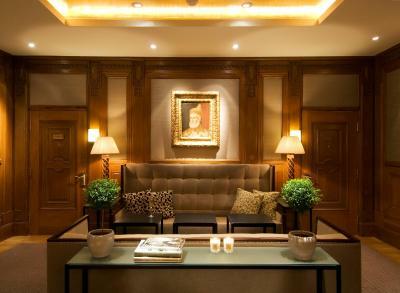 Hotel Diplomat has been owned and run by the same family since start - for four generations. 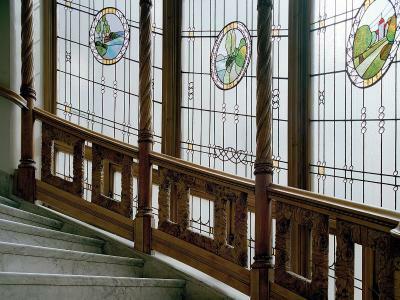 The name derives from its history as a host for several embassies during the first half of the last century. 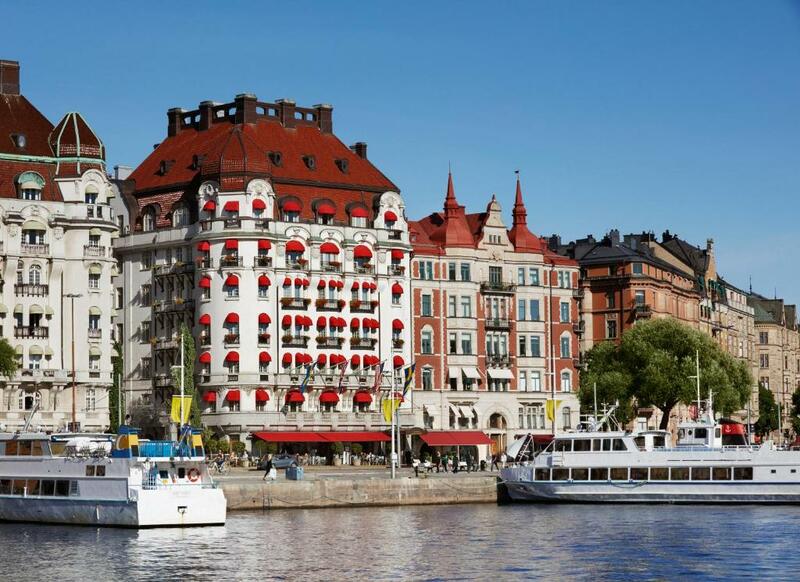 House Rules Hotel Diplomat Stockholm takes special requests – add in the next step! 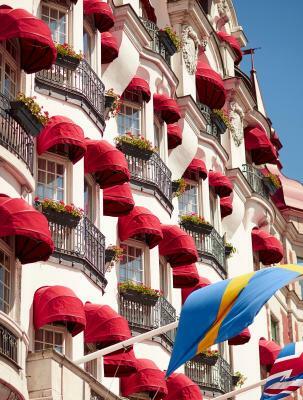 Hotel Diplomat Stockholm accepts these cards and reserves the right to temporarily hold an amount prior to arrival. Would have been nice with a view, but single rooms do not have one. Also late check-in from 15. Luckily mine was ready before. Perfect. Can recommend this hotel. Excellent location, close to the main station, theatre, water... fine room with everything you need. Amazing breakfast with lots of choices. Old and tired, overrated and overpriced. Friendly professional staff, stylish comfortable room / hotel. The location was excellent! 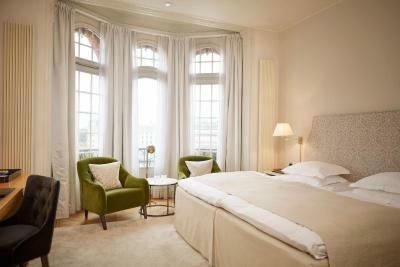 The rooms were beautiful, the staff were super friendly! The restaurant is delicious! The bar is cosy, there’s so much i liked about the property! First visit: Front desk staff spoke disrespectfully about us to her colleague (unaware we understand Swedish). Sauna was booked but turned off when we arrived; 45/60minutes wasted without apology. Latest stay: Front desk tried to sell us an upgrade on arrival. Superior double room had no bath (as promised). Shower drain smelled, was blocked & flooded the bathroom. There’s absolutely nothing to dislike about it! The staff were wonderful. There was a concierge named Maxwell who was fantastic a d provided helpful tips.